Flying into Papeete Tahiti from New Zealand was like hitting a brick wall. Oh the heat. The airport is all open but that still didn’t seem to help. Tahiti wasn’t exactly what I thought it would be with small pebbles not sand and the humidity was so bad that after washing my clothes in the morning and hanging them out I came back at the end of the day to find them wetter than when I left. Some people reckon that Tahiti is not so expensive. I think they must come from Europe where the exchange rate works in their favour. It is picturesque and the few photos I took are great but overall I was disappointed. I only used Tahiti as a connection for getting to Easter Island so shouldn’t complain too much. Most travel here as couples and it’s a major honeymoon destination. The islands around the main island are reported to be nicer. 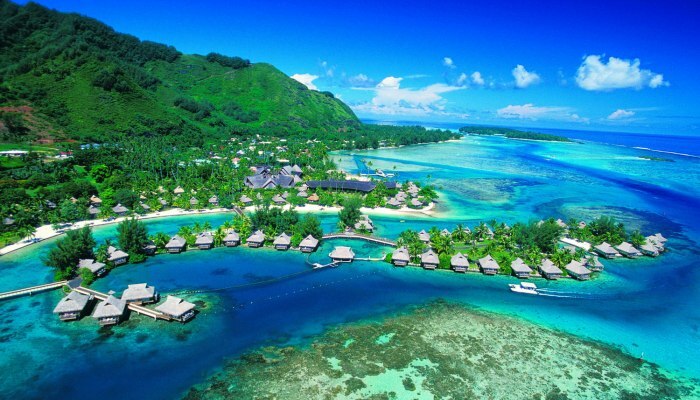 Places like Moorea and Bora Bora. The main island of Tahiti is rather mountainess and covered in a lush tropical forest. It has a tendency to have tropical downpours late in the afternoon. While I was there it actually poured down for a whole day. On the whole though it does have a pretty good bus system for getting around or if money is no problem hire a car. There are ferries for getting to all the islands as seeing as tourism is a major earner for this country it is well set up to cater for them. It has excellent diving, snorkelling and fishing, not forgetting the swimming. 1) Take water with you everywhere as you are going to need it. Sweating and feeling sticky goes with the territory. 2) Get out to the other smaller islands, the pebbles are reported to be smaller and therefore are like sand. 3) If you have access to a dryer use it. Hanging your clothes out to dry to pretty much a waste of time. 4) You have probably paid alot of money to get here so get out and enjoy it.